I, like Arabelia, bring news, although mine are not bad! I have been struggling for some time to get the script of Volume 2 ready while keeping up with pages and my client work. Imagine how it felt to realise Volume 1 pages will be over in about two months or less, meaning I have to start preparing the printed edition. Alongside everything else. Also putting a Kickstarter together. I mean I could probably do it all, but it won’t be as good as if I have a bit extra time to put into the book design, the covers and the marketing a Kickstarter campaign needs to actually get funded. (On top of this I’m starting a full time job next week, but more on that in a second.) I have found a solution: Volume 1 will include about 5-6 more chapters. This means an extra 6 months or so to get the book design ready, and it also means the actual book will be a bit thicker, which is something that I think will fit much better this project (otherwise it would have been around 1cm thick). It also means Volume 1 will end on a more exciting moment, by the way. I hope this isn’t much of a bummer for readers who have shown interest in a printed version! I asure you, the book will look so much better it will be worth the wait. Speaking of which, I know sometimes it’s hard to follow webcomics every single week and we can stop reading for a while and then come back. A very easy way to make sure you won’t miss the opportunity to get a printed version of Bookwyrms is to provide me with an email address which I can contact when it’s ready. I have added a little subscribe button in the right sidebar just for this. I promise I will not email you if it’s not to tell you any updates about the printed books of this comic. And wow, I almost forgot. 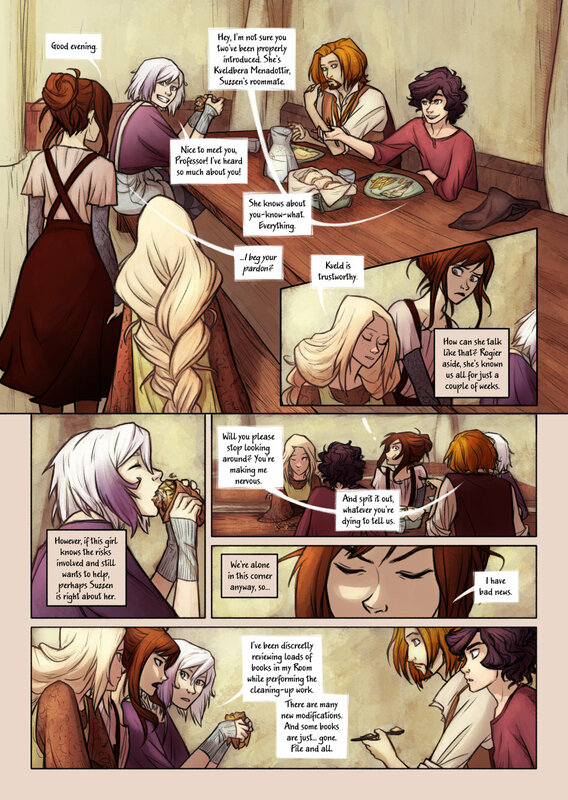 Last week I discovered that a company had been reposting the whole Bookwyrms comic automatically on different websites and social media without my permission. It’s been a nightmare of an experience contacting them, and reporting them to take the pages down. Unfortunately this is something readers or fans can’t help much with, since I, as the copyright holder, am the only person who can report them. BUT if you ever find pages on twitter, facebook, pinterest, tumblr, etc. you could do something that would actually be a great help: Comment with a link to this website. At least that way if people see it, they know where they can find the original source. I’ll be forever grateful! And that’s all! Have a lovely rest of the week! And for a second thought, I seriously hope there would be some sort of bigger movement for these reposters of webcomics, rather than silent little fights we do for our own when things go too far. It’s infuriating and as Youtube has seen quite a variable violation of trademark/fair use violations and the users not letting them get away with it anymore, I think there should be something applicable to us to fight this sort of nonsense more effectively being the solo indie authors we are. Thank you, Karoliina! ^^ I agree with you on that note… I guess it’s just too difficult to manage since reposting happens along the whole internet, not just in one place. I really hope these massive webcomic repostings don’t happen too often, it’s very scary to think in my case they had been doing it since last November and I only found out when they contacted me. revising? Did she mean reviewing? Or am I misunderstanding what she’s doing? OOHH! Bigger book! I’m not disappointed at all, it sounds exciting! And if it’s better for you, then wonderful! I’m so sorry about the reposting! That’s horrible and must be a HUGE pain! One of my favorite fan-artist’s work has been reposted on different websites as well! Hopefully you can fix it up! I’ll let you know if I see anything else. I think I’ll probably stay up to date with Bookwyrms, but it will probably get harder over the summer and, as a guest, am likely to forget. Is there a way I can get my email to you in a more private way for those printed edition updates? And wonderful page! The drawings are as beautiful as ever! I particularly like the last panel. Oh! Never mind about the email part! I found to box and subscribed! Aww, thank you so much for reading Bookwyrms and for subscribing 😀 This is the easiesst way I could find to make sure people interested in a printed version won’t miss the chance to get one when it comes. I wish more webcomics had this feature, honestly. I tend to read them from time to time but I definitely want printed copies of them and it’s difficult to keep up with news from all of them. I think when Rogier says She knows about you-know-what everything. It should be She knows everything about you-know-what. No worries! 🙂 Those are very small in the font I use for the comic, it’s something I’ve been meaning to fix but I haven’t had the chance yet.